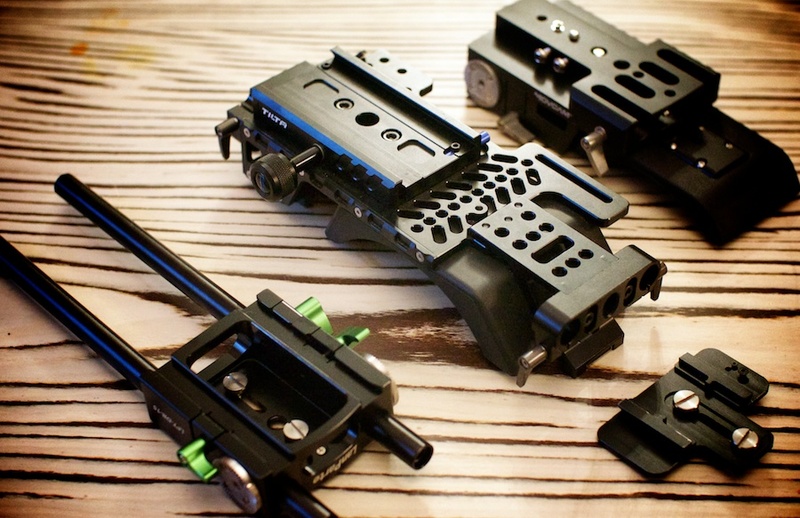 Camera Rigs, Man Cages, Man Handles, whatever you want to call them, we all need them. Lets get away from the obvious question of why most camera manufacturers cannot design an ergonomic camera in the first place and seem to think that square bricks are the way forward, and jump straight into some of the options we’ve looked at, used and moved on from. This is specifically for the FS700 (and FS100 to a lesser degree). Why do we need to rig the camera? Well, because a shooting camera - be it handheld or tripod bound - usually needs extra ‘stuff’ on it - from external batteries, microphones, monitors and recorders, to adding better placed handles, follow focuses, matteboxes, support for heavy lenses, better weight for shoulder usage etc,. As for rigging our cameras. We started with the usual offerings from companies such as Shoot35, Jag etc,. however they really didn’t stand up to what we needed them for. The weakest part of these setups were the prosumer dSLR style tripod quick release mounts. They just aren’t robust enough to be used all the time. This was made blindingly apparent at having to catch the FS100 as the rig slid off a tripod. That was a defining moment and really focused our minds onto what was important in a rig. I’m not saying these systems won’t work for you, it depends how much rigging on and off different bits of gear and the kind of abuse they may get. For us, in our experience they didn’t work. Look carefully at locking mechanisms and single mechanical points of failure. The next rig we used was based on the Tilta shoulder rig. We bought two of them, one for each camera and shot most of the feature with them. They’re well designed, very solid and the base of it will slot into the Sony VCT mount. The VCT mounts are industry ENG standard and the locking mechanism is very robust, there’s no way are they going to fall. We had different mounts on our tripod, dolly, slider and so on. So it was fairly fast to click the cameras onto whatever setup was needed. An important feature of the rig was to ensure there was enough space from the rods to under the lens mount so that the mount can be fixed to the rods. Without this extra stabilisation it would mean that lens and adapter is totally reliant of the connection of the lens mount to the camera. For lighter lenses this isn’t a problem but for heavier zooms it can generate visible flex. In addition, if a follow focus is attached then, when a hard stop is reached it will twist on the mount and produce a torque force that can damage the cameras mount. You can actually see the lens twist at the end of a focus pull and it was even visible in the footage. Remember that the 700s are prosumer, they’re not as robust as more expensive cameras. A good solution is to use a mount that takes advantage of the tripod collar underneath most adapters. We use one from MTF services who are a fantastic little UK company producing lots of rig and adapters, cannot recommend them enough. The Tilta has a built in shoulder pad too, it’s angled slightly for the shape of most shoulders. They’re pretty heavy and camera weight is an issue, we’d be looking at 10kg of weight which can be quite tough going (or i’m a lightweight). After a while the shoulder pads are really quite uncomfortable too, they’re very hard foam. The biggest design issue is that there’s a two stage lock. You mount an adapter to the camera then use this adapter to slide into a plate on the base itself. The standard adapter is a T shaped affair and the problem is that it’s just not big or stable enough. The camera flexes back and forward and the amount of metal that’s actually locked into place doesn’t seem enough. We got around this by using a normal tripod adapter plate instead of their T shaped one which offered more physical metal to lock into place but it’s still a single point of failure. So as much as we like them, we carried on looking. 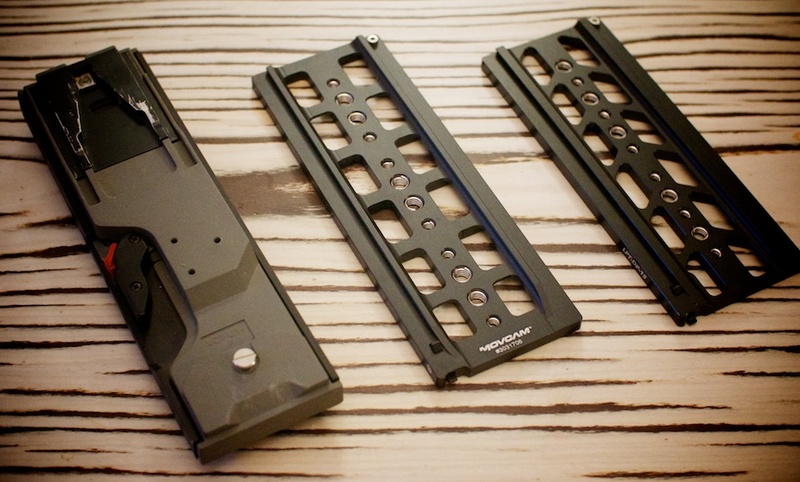 There’s a lightweight dovetail base plate from Lanparte that we tried, it’s very compact and the biggest difference is that it slides onto a dovetail plate. This gives a lot of adjustment back and forward yet still remains very secure. Very much the evolution of the VCT. The problem with the lanparte is that there’s not enough height between the rods and the camera for the lens mount adapter so we’ve need to build up with spacers. Not ideal really. It’s been a useful baseplate for the FS100 in some situations but not enough for the main camera. We’d been eyeing the micron range which looks great but it is very expensive and doesn’t appear to have support for rods at the back of the camera. This is a problem because that’s where the battery needs to go and also for counterbalance. 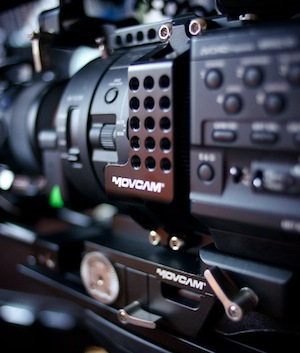 Eventually we bit the bullet and got a movcam setup in and this is what we’re currently using. 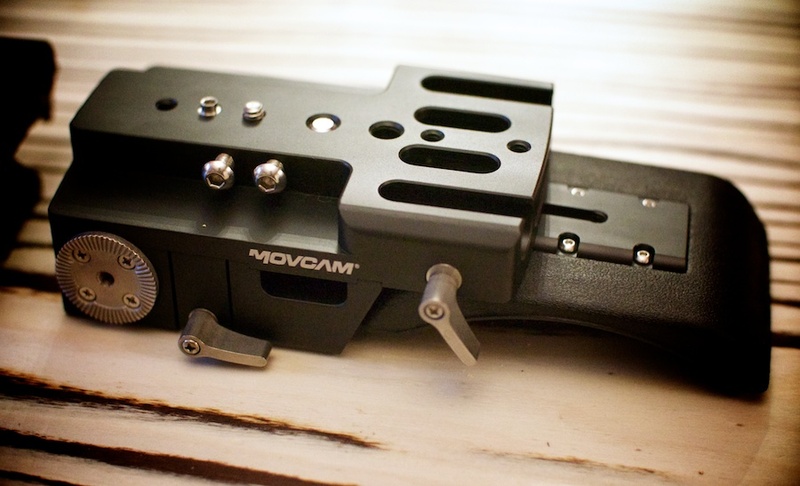 We had a movcam top handle for a while, it’s been great to use, very flexible and well made/mounted so it made sense to look at the rest of the rig. 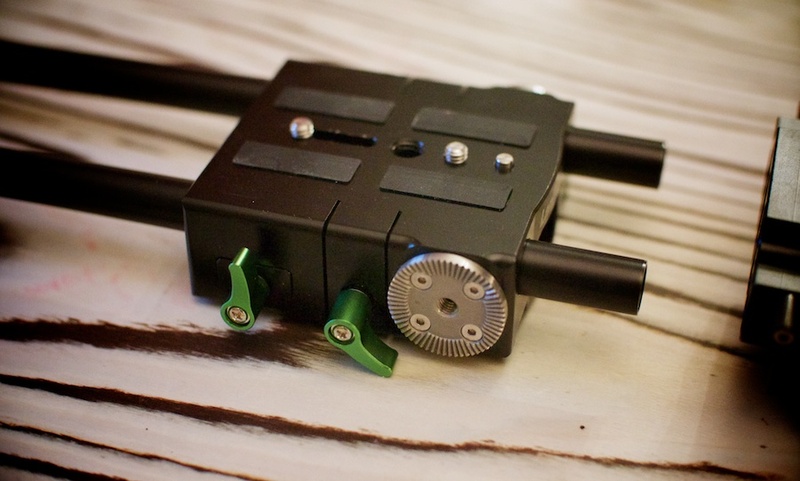 It’s a little lighter than the Tilta and it uses dovetail base plates so it can be adjusted back and forward very easily (useful for finding the centre of gravity on tripods). It’s more compact but still offers the height. It’s totally locked into the camera, all the way from the baseplate to the sides and top handle - a more solid connection than the Tilta. 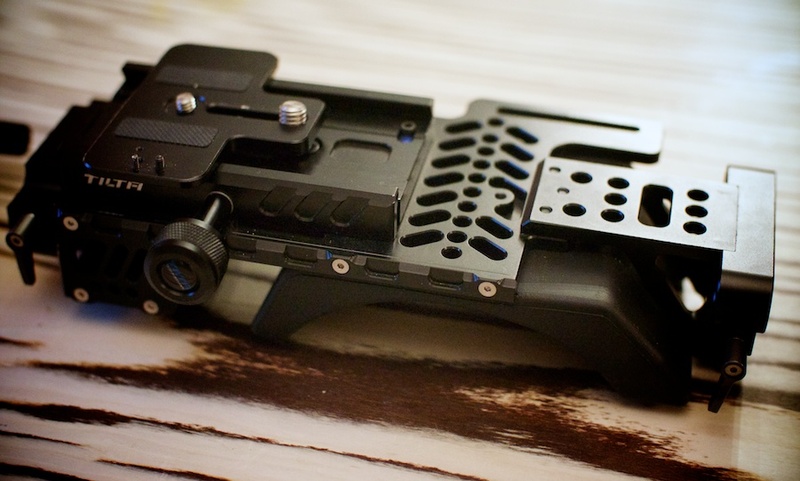 It has arri rosettes so handles and extensions can be easily connected. It has a built in shoulder mount but we’ve not used it enough to form an opinion on how it feels in day to day use, it looks more lightweight than the Tilta option. So our journey has finished, or paused, with the Movcam option, i think it looks better than the others but it hasn’t stood the test of time yet. The next area to look at is better handles, or perhaps wooden grip like the Aatons, so we’ll update this post at some point in the future. In general though the Tilta stuff is really well made and perfectly useable, i wouldn’t hesitate in recommending it. However the Movcam right now just had the edge. There is a lightweight Tilta baseplate announced too, this is worth looking at although i feel that it will suffer the same height issue as the small lanparte version.